Yellowstone National Park is the crown jewel of the American park system. 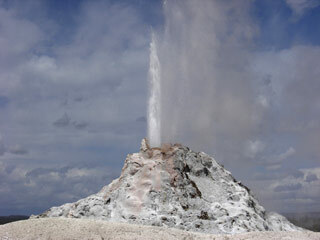 It's home to steaming hydrothermal features - hot springs, mudpots, fumaroles and geysers. Yellowstone National Park boasts thundering waterfalls, crystalline lakes, panoramic vistas and a remarkable diversity of wildlife. What's more, Yellowstone has a history of colorful characters. Mountain men, fortune seekers, Western Artists and Native Americans have left their mark on Yellowstone, in one way or another. Visit Old Faithful, the world's best-known geyser. Tour the travertine terraces at Mammoth Hot Springs. Hear mud pots plop at Artists Paintpots. Listen to fumaroles hiss at Roaring Mountain. Learn about thermophiles at Norris Geyser Basin. Find out what substance makes Mud Volcano so distinctive. Get a glimpse of the earth's interior at the Grand Canyon of Yellowstone. Watch wildlife in Lamar and Hayden valleys. Soak in the Boiling River. Float the chute on the Firehole River. Ride horseback in Gardner's Hole. Go for a boat ride on Yellowstone Lake. Take a self-guided ramble on a wooden boardwalk. Hike a rarely traveled backcountry trail. Uncover history at Fort Yellowstone. View paintings by Thomas Moran at the Albright Visitor Center. Partake in a ranger-led program. Earn a junior ranger badge. And if you are visiting in winter, snowshoe and x-country ski in a group or individually. Few places in the world are as wondrous as Yellowstone.